In late June 2014, a Honda Accord owner from the Santa Monica, California reported to NHTSA a May 31 low-speed fender-bender that deployed the airbag bag, “sending hot metal and plastic shrapnel into the cabin. As a result of this minor accident my daughter sustained severe burns, bruises and abrasions on her arms and legs. Honda admits that the airbag was not designed with this in mind but refuses to take any responsibility other than to present me with a bill for $3700.00,” the Honda owner wrote. At the time, the 2005 Accord hadn’t ever been recalled for an airbag inflator rupture – although some 6 million Honda vehicles had in nine campaigns going back to 2008. Honda was well-versed in the problem afflicting airbags supplied by Takata, having settled its first claim in 2004. 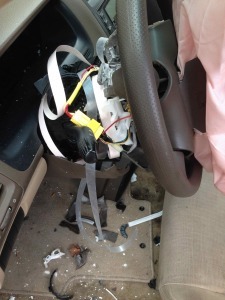 The defect – airbag inflators that deploy in low-speed impacts with excessive force, causing the bag to explode sending metal and plastic fragments flying into the occupant compartment – has been tied to at least two deaths and 139 injuries. 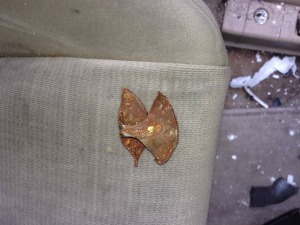 Specifically, Honda’s defect notices have referenced “separation of the metal airbag inflator shelf, resulting in metal fragments of the shell being propelled through the airbag fabric. The defective bags also have been installed in vehicles manufactured by Toyota, Nissan, Ford, Chrysler, General Motors, Mazda, Subaru, Mitsubishi and Isuzu – all of which have announced recalls covering 14 million vehicles. Excessive internal pressure caused by the handling of the propellant during airbag inflator module assembly. A manufacturing process that occurred before assembling the inflators – the process of pressing the propellant into wafers, traced to one particular high-precision compression machine. Problems with a manufacturing process used to prepare the propellant that may have been out of specification. Propellant produced in 2001-2002 could be out of specification without the plant knowing it. Honda was more responsive to NHTSA. Ten days after the agency received the complaint, Honda added California to the list of states in which owners were eligible for a repair. Besides Honda, six manufacturers are participating in the regional recall: Chrysler, Ford, Nissan, BMW, Mazda and Toyota. But, it’s likely that this defect has more death and injury victims. The Center for Auto Safety has accused Honda of failing to report some legal claims – including one of the known deaths, an Oklahoma teenager in 2009 – to NHTSA, as it is required to do under the Transportation Recall Enhancement Accountability and Documentation Act. In response, Honda has hired a third-party auditor to investigate. And it’s likely that complaints will continue to be lodged, because the root cause or causes have never been definitively identified. In addition, some owners of affected vehicles have complained that they did not receive an airbag recall notice, so consumer notification is another unresolved issue. This recent complaint suggests that all of the affected vehicles have not been recalled.